Fitting the Common App Essay Prompts into Your Curriculum. The Common Application is a universal online application that most colleges have switched to in place of individual applications. However, most teachers and students don’t seem to realize how much leeway the Common App essay provides. 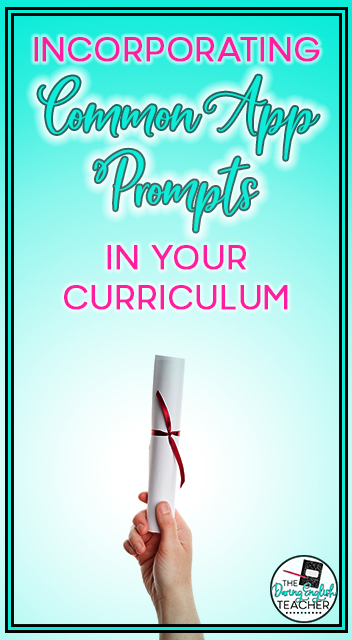 The first six prompts are merely aimed to kickstart students into a certain kind of thought process that will help reveal their values and passions. If the student feels inspired to write something that doesn’t fit any of those molds, the seventh prompt for Common App provides the opportunity to write about anything. My personal statement mini-unit is a good starting off point for brainstorming some of these topics. 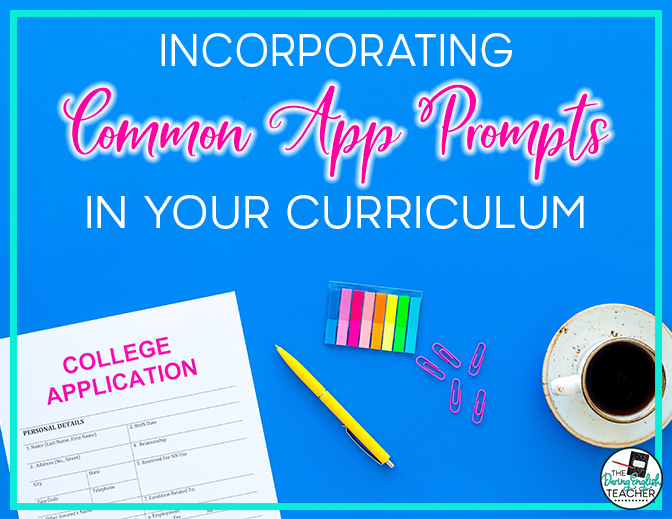 There are lots of ways to fit the Common App Prompts into your curriculum as early as the first day of school. Whether you use these suggestions as exercises or turn them into assignments, they are bound to push your students in the right direction in their college application process. Have students list a significant moment in every year of their lives since they were born. Once they have completed the list, instruct them to pick one of the years and write a one-page story recounting the moment. Require that they mention a lesson they learned during that period in their lives. 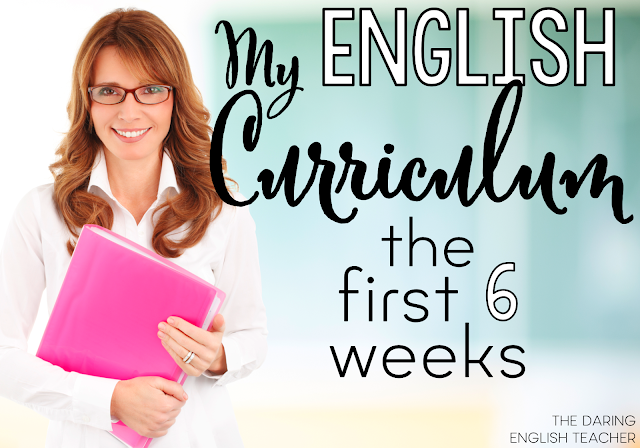 This exercise will help students discover what sticks out to them about their world. By naming a lesson learned in their past, students also begin to think about how their previous choices have shaped them into who they are today. Completing this exercise could fulfill Common App prompts 1, 2, 3, and 5, and 7. Instruct students to create a bubble map of their favorite hobbies. Then, have them name a fond memory associated with each hobby, along with a sensory image. For example, perhaps a student likes the guitar, and one of his favorite memories is having his father teach him how to play. Maybe the first sensory image that pops into their head is the musky scent of their father’s cologne. Once students have completed their map, have them pick the memory that seems most vivid and make a list of all the other sensory images they can think of. Then have them write two paragraphs about the memory, including the sensory images and why the memory is so important to them. This exercise will guide students in unearthing the details that will make their essay stick out to an admissions council. The finished essay could fulfill Common App prompts 1, 5, 6, or 7. Tell students to bring an object in from home that is meaningful to them. It cannot be a book or a form of electronic. Have students write two paragraphs: the first about the history of the object (where it came from, who has previously owned it, etc.) and its physical appearance (what it looks like, feels like, smells like), the second about why the object is meaningful to them. Then, you can hold a high school Show and Tell where students present their objects to the class and give a summary of the history and meaning behind it. This exercise will help students start to view their interests and passions through unique lenses, like a physical object. College admissions officers read enough essays that state point-blank the student’s interests. By describing an object and reading into what makes that object special, students start on the right track of expressing their values and what they hold dear. A polished essay focusing on the meaning behind the object could fulfill Common Essay prompts 1, 5, 6, and 7.